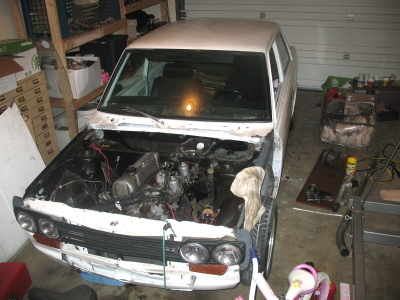 After sitting for six months, my 510 blazed through the neighborhood again. Well, maybe not blazed... I never took it past second gear, what with neighborhood speed limits and all that. I got a few looks, since the car is pretty loud. I don't have an air cleaner on my SU carburetors, and the lumpy cam makes the engine grumble quite a bit with the open air. In any event, it sure does feel great to know that she runs, and that all the work I've put into her has resulted in a vehicle that's capable of taking me from place to place. I swapped out the alternator. I'm still not convinced that the one I'm not using is any better, but the folks at Auto Zone say it passed the charge test. I also had to swap out the tension bracket, since the one I was using only fit the bad alternator I was using. Replacing it meant taking off the fan blade, which was a bit of a pain to do with the radiator in place. I discovered that my clutch master cylinder leaked. Not just a slow trickle, but a gush of brake fluid every time you pumped the clutch pedal. I ordered a new one off eBay for $33. After the clutch master cylinder broke, I figured I'd stop tinkering and just let it sit until the new part comes in.